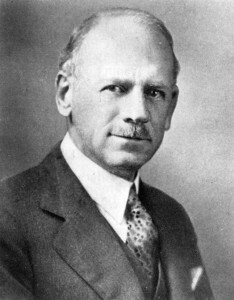 John Nolen (1869-1937) was the first American to identify himself exclusively as a town and city planner. Educated at Harvard University, Nolen is regarded today as the “dean of American city planning” and a pioneer in the field. He and his firm completed more than four hundred planning projects from 1905-1937. Among them were comprehensive plans for more than twenty-five cities across the country, including Venice, Florida. Venice is a thriving community known for attracting tourists and seasonal residents due to its pleasant climate, beautiful beaches, and easily walkable and bike-friendly downtown. The city’s livability and appeal are the result of John Nolen’s 1926 General Plan and the City of Venice’s commitment to maintain Venice as a vibrant, charming, historic community in which to live, learn, work and play. Examples of the original planning and landscaping design features have been preserved for almost a century and remain one of the city’s truly deep-rooted assets. In his Venice plan, Nolen sought to achieve a balance between two ideals—the promotion of civic virtue through the harmonizing effect of urban planning and the humanizing influence of the beauty of nature. For Nolen, “nature led the way” and the plan, Nolen wrote, “followed her way.” He envisioned Venice to be a new type of community where a blend of wilderness preserves, agriculture, and urbanism would sustain the landscape. The plan featured a commercial center, schools, a linear park along the waterfront, as well as parks and green spaces throughout the city’s residential neighborhoods. He designed large boulevards as the major traffic arteries and smaller, hemispherical and diagonal streets for the residential sections. Through zoning, Nolen attempted to codify the use of every parcel of property, both public and private. This codification into residential, commercial, industrial, and civic uses still defines land use in the city today. It gives Venice the sense that things are where they should be and gives Venice its sense of place. In 2010, the John Nolen Plan of Venice Historic District was listed on the National Register of Historic Places to preserve Nolen’s original urban design, considered significant for its parks, street landscape features, and overall Traditional Neighborhood Design. The District is comprised of major portions of the City of Venice platted from 1926 to 1929. While many elements of the Nolen plan remained incomplete as late as 1948, the plan was never abandoned and subsequent development followed the intent of the original plan. Approximately 847 of the original 1,150 acres of the projected subdivisions in Nolen’s plan are part of the historic district today. Three smaller districts within the plan are also listed on the National Register. They include the Venezia Park District, Edgewood District and the Apartment District (also known as the Armada Road Multifamily District). The initial construction of the Nolen plan was implemented by the Brotherhood of Locomotive Engineers from 1926 to 1927, during the Florida real estate boom, until the bust. Although affected greatly by the Great Depression, Venice survived and would emerge decades later as a model city for a new movement in urban planning–New Urbanism.